[Quinn Dunki] just reported in on the latest iteration in her computer project which is called Veronica. This time she added RAM to increase the VGA performance of her build. Like just about every other part of the project, [Quinn] knew what she wanted to do, but had to overcome a lot of issues along the way. The goal is to implement a 256×240 display with 8-bit color depth. [Quinn] says this is on par with game console technology from the 1980’s. The problem is that the 10MHz AVR controller can’t really keep up with the scan rate of this size of display. The answer is to add RAM which stores all of the color data, the microcontroller will simply advance the address pointer on the memory chips to match the sync rate of the VGA output. After hooking up her hardware design she gets a screen full of uninitialized pixel data. But moving from there to the final product seen above was quite frustrating. It turns out that noise on the breadboard was most of the problem, further compounded by entire breadboard row which wasn’t contacting the wires to make the temporary connections. A bit of jockeying for position and by Jove, she’s got a boot screen. That breadboard sure has become crowded since her first VGA experiments. 1, 2 and 4 bit color or 2, 4 and 16 colors were the norm for small computers. As for game consoles, they were somewhat better in the number of colors onscreen. The NES was capable of 12 sprite and 13 background colors onscreen out of a palette of 64. In the early 80’s only very expensive graphics workstations could put 256 (or more) colors on screen at once. Then in 1985 along came Amiga with its Hold And Modify mode capable of 4096 colors. IBM first version of VGA in 1987 could do 8 bit color but only at 320×240 resolution. Also in 1987 the Macintosh II (very expensive) was capable of 640×480 in 8 bit color, but only with an upgrade (even more $$$) to its video card’s RAM. It wasn’t until the 1990’s and especially the 1991 release of Windows 3.1 that graphics capabilities of personal computers began to expand both in resolution and the number of displayable colors. Thanks for the post HaD! Veronica’s color format is what I would call 2-bit color depth, or “6 bit true color” (as opposed to a palette-based color indirection system, as was also common in those days). It is perhaps most similar to the Apple //’s HiRes mode, although without the limits on which colors can coexist on adjacent pixels and such. The Woz pulled off some real voodoo to get the resolution he did in the memory he had, but there was a price to pay in flexibility. 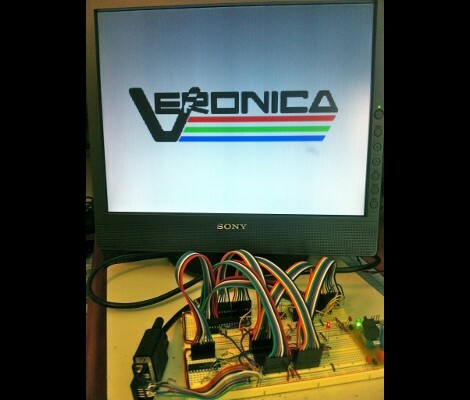 I would describe Veronica’s color format as 2-bit color depth, or “6 bit true-color”. This would be as opposed to, say, the palette-based color indirection systems that were also popular in the 1970s and 1980s computers. Veronica’s system is probably most similar to the Apple //’s “Double HiRes” mode, but with a little more depth and without the restrictions on what colors can occupy adjacent pixels. Also, of course, the memory mapping is linear with no holes. The Woz did some amazing voodoo to get the resolution he did with the memory he had and such a low chip count, but there was a price paid in flexibility. The Acorn Archimedes, 1987 and also not cheap could do 640 x 480 with 256 colors. This is much the same as the FPGA project I implemented last year: designing a 1980’s video game on a Spartan 3an. Essentially used two sets of dual port ram to implement a foreground and background set of sprites with a transparency applied to the foreground. So basically, they added a frame buffer? Why does she have to limit herself to 10MHz? All AVRs are specified up to 16, but in reality they easily can be overclocked to 20. And those specified up to 20 like mega*8, can do all 24 or maybe more. The limiting factor is I/O bandwidth. The bigger ATMegas can run at 20Mhz, but the I/O ports are limited to 10Mhz.